Nestled away in its own special part of Zululand, Thanda Tented Camp offers guests a meaningful and authentic African experience. welcome reprieve from the invasion of technology, light, and sound became a worry. It quickly dissipated as we learned that the bar area had a constant supply of electricity and a steady stream of wi-fi day and night and, as we sat down to lunch on the comfort of the couches there, adding my phone and laptop to the charging throng of those belonging to the other guests, I welcomed the thought of an excuse to spend more time there. It didn't take long to feel like we had been transplanted on some exclusive inland island; one so evidently designed around a sincere and poignant love of the bush and the wildlife and people that call that landscape home. It is elegant, unimposing, and natural – an almost fluid yet striking extension of the earth itself. We made our way along the path to our tent and indulged in one of life's small graces - a cold bottle of water in a comfortable chair on a deck ensconced by trees overlooking hills where as yet unseen elephants' ears flapped like a dozy metronome and leopard concealed themselves in the mottled shade. The sun shone through the canvas walls of the tent behind us casting an orange slideshow of shadow and light and I took it all in as an experience of Africa I never wanted to forget. That afternoon, we went on our first game drive with our guide, Willard, and tracker, Zeblon. Off the back of the success of the Suunto Movescount app at Fugitives' Drift, I had decided it would be a perfect way to record all of our game drives, creating a video of all of my photos at the end. I also had the Africa: Live app, which allows you to share your sightings on a map, as well as the Sasol eBirds of Southern Africa, and eGuide to Mammals of Southern Africa (admittedly, the Lite version) ready to go in anticipation of all the sightings. We quickly spotted zebra, giraffe, wildebeest, a pair of white rhino, and herds of impala in the foreground of astonishingly beautiful Zululand views that stretched out in an ancient pose far into the distance. vehicle was stopped to allow Willard and Zeblon to investigate further a smudge of a print it was a miracle to have seen from the vehicle. Their conversation and deliberation was in a language we didn't understand as if in collaboration with the earth. When we got back that first night, the bonfire had been lit and the tables had been laid in the silence of the African night. For ages, explorers of Africa have ended their days enjoying a meal around a fire, the aspirant sparks catapulting themselves into the endless pinprick stars in an effort to make a moment last forever, it being the natural course of things for sunsets to give way to dinners sourced from nearby - an opportunity to recount the events of the day and maybe even indulge in a little bit of whimsy. We were led back to our tent by a porter with a lantern - a reminder that this alcove of luxury had an edge of danger. Before the sun dappled our tent in the morning, we were up and out for an early morning game drive. Armed with my Swarovski binos and my exciting new adaptor that allowed me to transform my phone into a camera with a telephoto lens, I quickly attached my phone to the binoculars. During the course of looking down, I miscalculated the length of an overhanging branch of a thorn tree and found my face connecting with nature's rude awakening. Blood filled my hands and I avoided panic by listening to a calming, guilt-stricken, all-attentive Willard and by reminding myself that faces often tend to bleed excessively - a tantrum of blood that is no indicator of the severity of the wound. With a gash to my eyelid, a slightly blackened eye, and some scratches to my face and pride, I talked myself out of going back to the camp - and thankfully so. Not long after, a perfect herd of elephant made the daily commute to Thanda Lodge to drink from their favourite watering hole. Calves stomped along driven by mischief tempered by a sense of purpose; a bull stepping in the road to survey us heavily before turning with a toss of trunk and ears to rejoin the group. And then, a little further down the road, casually and without warning, the shadow of our game drive vehicle became the chosen shady spot of a lioness tired from the exertion of a kill. Within arm's length from where I was sitting, she passed next to me. Despite the already increasing heat, I felt an instinctive shiver run through me in some innate reverence of her power. Out of the bush came another lioness and a line of trotting, hungry cubs eager to tuck into breakfast. We were fairly close, but not close enough for my standard iPhone camera to take photos without zooming away the quality, so I watched and took photos through the binoculars, cursing pesky branches that got in the way. Little did I know that, in that moment, a newfound love affair began between me, my favourite Swarovski binoculars, and this amazing adaptor. A vulture on a branch far in the distance was magnified right into the scope of my phone and gave an added dimension to looking at the wildlife we saw from afar. The Manfrotto monopod gave the binoculars and adaptor stability on the somewhat shaky game drive vehicle and this set-up of binoculars, phone, and monopod quickly became my extension. I didn't want to go anywhere without it. At around lunchtime, we had booked ourselves into the introductory wildlife photographic course on offer by guide and resident photographer Christian Sperka. I chuckled to myself at the thought of sitting there with my iPhone in a room dominated by Nikon and Canon. When I flashed my phone to Christian as my camera of choice, he was completely unfazed, saying that he offers iPhone wildlife photography courses too. Touchè, Mr Sperka. Showing me footage from the site of the kill that morning on his own iPhone, I felt a twinge of jealousy. There is an art to smart phone photography too and I could do with some instruction. There's no denying that the quest for a great wildlife photograph on safari adds another dynamic to game drives. By following a few basic rules and downloading the right apps, your phone has the capability to take some impressive snaps. The photography course comes highly recommended. We saw four of the Big Five that day; the tracks of a leopard taunting us for missing out the following morning. A pair of black rhino and a calf were detected from a ball of red dust kicked up in the distance and we watched until a snort and a tail-raised charge signalled the end of our welcome. A herd of buffalo strolled around us, the old dagga boys regarding us with what felt like a mixture of disinterest and contempt from under their curlicued wig of horns. A couple of young cheetah reclined on the other side of a fence, their bodies prostrate, their twitching tail tips and regal raised heads observing us with the tear-stained eyes of an unshaped youth. These were but a few of the animals we saw, all of us tumbling from the game drive vehicle after every trip, feeding off one another's excitement as we relived what we'd seen. The boma, tucked away down another wooded pathway away from the tents and the relative bustle of the pool and bar area, was easily one of my favourite places at the camp. A wooden deck and lush leather couches overlooked a watering hole. My solitude was broken only by the unobtrusive flickering tail of a nyala bull silently grazing nearby. I decided to do a quick time lapse of the view. I twisted the legs of my Loha tripod around the balustrade of the deck, attached my iPhone, and sat down for a few quiet minutes to let them do the rest. The wind had picked up significantly so even the wood of the structure around me seemed to quiver, but the fist of the tripod seemed unmoved by the challenge. In the flurry of activity, I managed an outdoor shower. I flung my clothes into a nearby tree and enjoyed the water washing away dust and fatigue and sealing in the memories of idyllic days that were busy yet unrushed. Looking at the sunlight through the branches on my skin, I felt the unique kind of relaxation that comes with surrendering to the impulse to escape into the remote, unspoilt wilderness that has an origin in us all. Thanda Tented Camp invoked that in me and appealed to my yearning for it the moment we arrived, nurtured it while we were there, and reminds me of it in every memory. The watering hole for man and beast: Game drives punctuated by drinks stops give the safari-goer a great chance to take in the scenic Thanda views and chat with guide and guests - all with the possibility of animals coming down to drink at the end of the day. 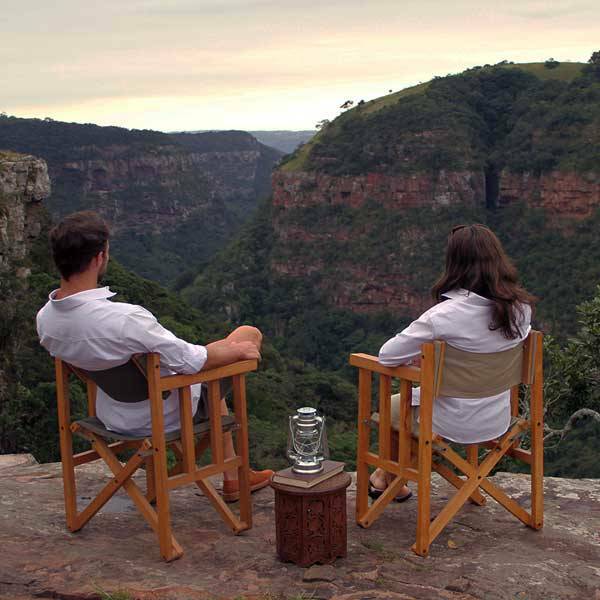 Having shown interest in our iPhone safari at Thanda, Alyson Taylor was kind enough to sit down with us to talk about how she and her husband, Peter, came to be at Thanda, travel, and mobiles. How do you normally book your trips and how did you come to choose Thanda? It is our first time on safari and our tour operator recommended Thanda. It took a large number of flights to get here, but we have fallen in love with South Africa and are seriously considering buying property here. We also did some research on TripAdvisor. We travel often and usually use booking.com to compare prices. We like quirky, different places and I always leave a review on TripAdvisor. It's like social media to see how many people have read your reviews and it's good to know you are contributing and sharing your experience with other would-be travellers. Do you have any comments on the use of mobile phones when travelling? I use Facebook probably more than our sons. As a parent and while we are away, it is a great way to stay updated on what is happening without making a phone call. We have used online check-in, but printed a hard copy just in case. My charger broke after we got here, but I would usually use my phone for making calls and taking pictures. I have a camera, but use my camera on my phone to take panoramas. If you had been on your phone constantly during a game drive, we probably would have said something. It can be very distracting, which would take away from the experience for everyone else. 'Thanda' means 'love' and everybody that works here works out of a corresponding love for Thanda. 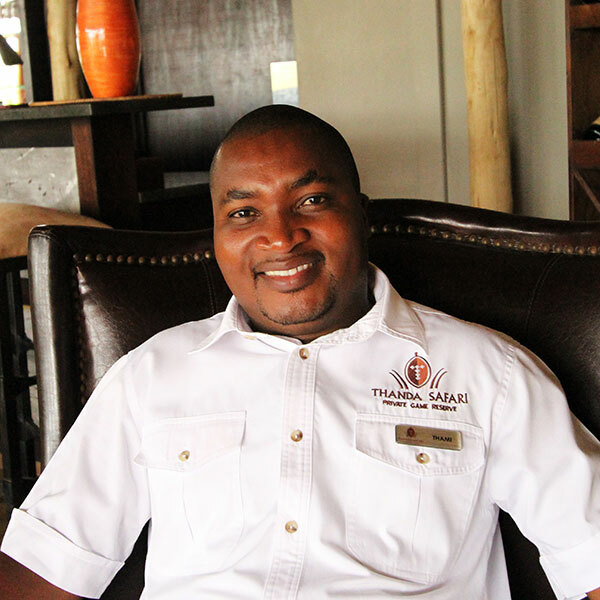 We sat down for a chat with Thami, the enthusiastic manager of Thanda Tented Camp. For the most part, how do guests hear about you? The majority of our bookings are made through tour operators and agencies. We also get a number of online bookings from word of mouth recommendations. 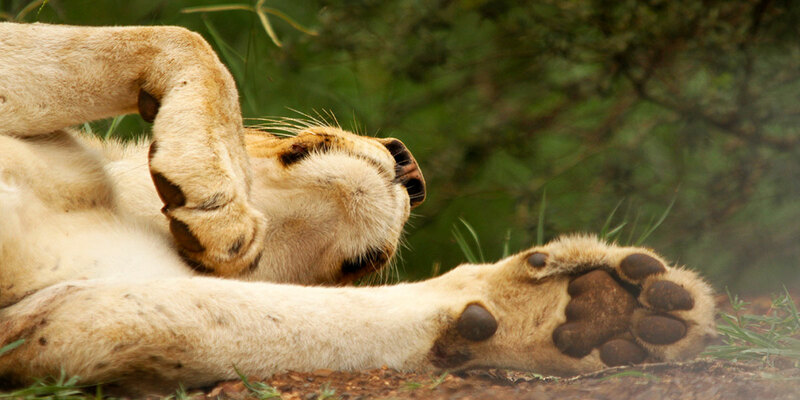 Do you have any comment about how mobile-friendly Thanda is for the purposes of planning and booking a safari? It's very quick and easy to book on your mobile. Last night, a Dutch couple phoned us because they were driving past and found us by doing a bit of research on their phones. Thankfully, we had space available at the tented camp. I wouldn't recommend that. It is better to book in advance to be sure of availability. Being here, it is evident that Thanda is passionate about people and is true to its setting. Can you tell me a little bit more about how this passion finds practical application on the ground? Thanda is very hands-on with the community. Dan came camping here and fell in love with it. He negotiated with the king and one of the main reasons Thanda was built here is because he wanted to help with unemployment in the area. 90 per cent of the people employed here come from three communities in the area. 'Thanda' means 'love' and everybody that works here works out of a corresponding love for Thanda. Guests at Thanda have the opportunity to have an authentic Zulu experience during their stay with us, which includes visiting a traditional Zulu village, meeting a sangoma, interacting with the locals, and meeting students of one of the over 100 Thanda-funded schools. The Zulu experience is very popular and many of our guests want to know the old way of living and see how the locals live now. This also benefits the community and the families participating in the experience are paid for their involvement. 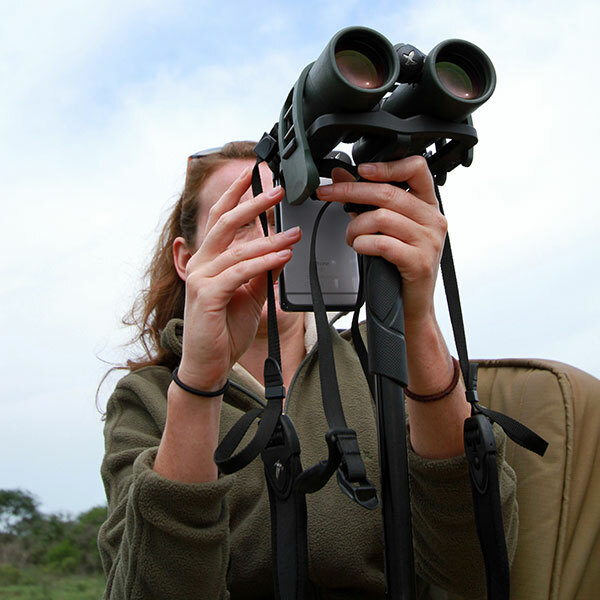 Thanda is passionate about conservation and the Thanda Wildlife Team are on the ground to ensure the protection and well-being of the wildlife in the reserve. They are responsible for maintenance, monitoring, and population regulation. Guests have the chance to work with the Wildlife Team for a day, assist them with their tasks, and learn more about conservation as they go. Tell us a bit about what makes Thanda special. Thanda is in the heart of Zululand. The landscape around our properties is very beautiful and the area is rich in history. 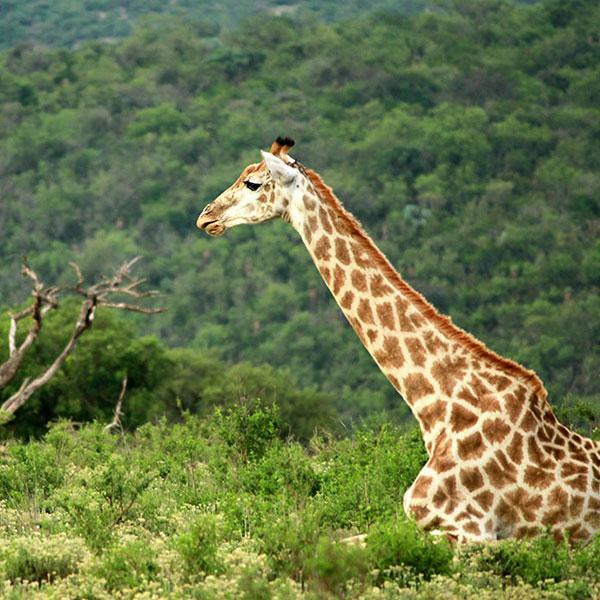 The reserve is privately-owned and well-run and guests have a high chance of seeing the Big Five. Mostly, it is the people that make Thanda special. Our employees are guest-focussed - everyone wants to work for Thanda! There are three properties in the reserve. 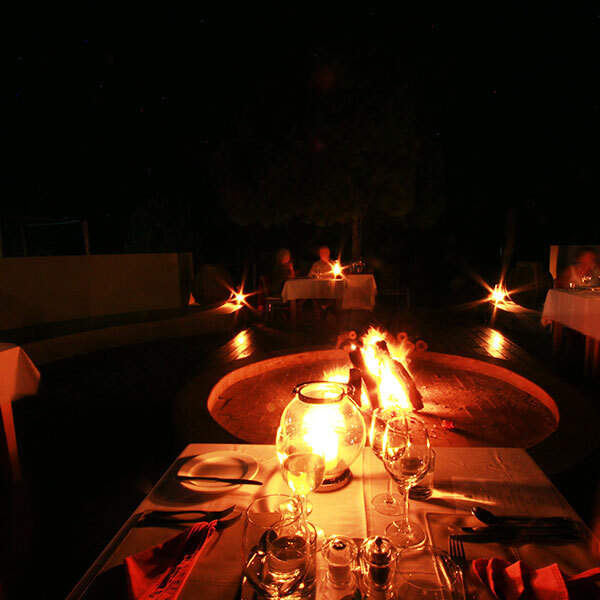 The lodge is very formal, the villa is perfect for families and functions, and the tented camp caters mainly for groups although it is well-suited for couples and single travellers too. The tented camp seems to be the preference among our guests. I think this is because it is more African and offers an authentic experience. Wildlife heaven: Game drives at Thanda present a wonderful opportunity to see a range of wildlife and observe their natural behaviour as part of a memorable safari experience. Providing a commentary to our game drives and wildlife encounters, Willard elevated our time at Thanda with entertaining anecdotes and facts about the bush and animals we saw along the way. We chatted with him about Thanda, safaris, and mobile phones. Tracking was a big part of our game drives at Thanda. Tell me a bit about our tracker, Zeblon, and how you work together. Zeblon is very diligent and very quiet and has a natural bush eye. 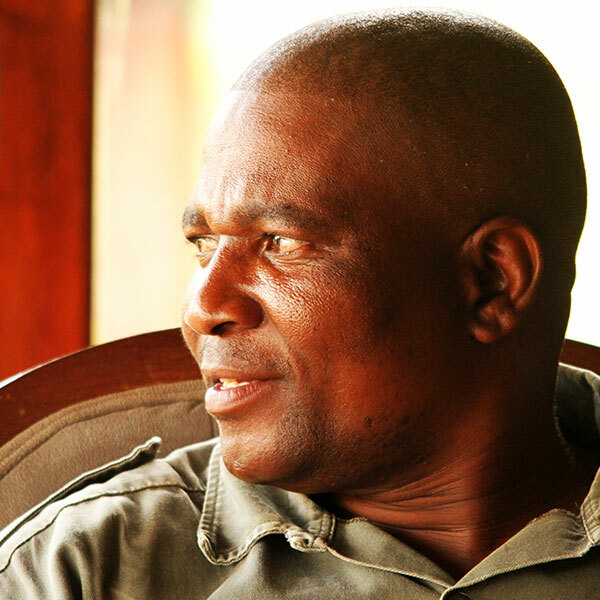 He did a tracking course and trained at Phinda and went on to work there for a year. He has been at Thanda for three years and I insist on working with him. I am fast and busy and Zeblon calms me down because he does things at his pace. We are very successfully married professionally. On top of that, we work as buddies and I think we advise each other better because of it. Tell me about your background. How did you end up at Thanda? I'm originally from Malawi, but I have been in South Africa for ten years. I started working at Bayete Zulu in 2006 and introduced elephant interaction in KwaZulu-Natal. I was there for two years before I was offered a job at Thanda. In Malawi, I was a biology teacher but quit to go into wildlife management. I studied for two years. It was very intensive, covering 26 subjects that included everything from wildlife research to community outreach programmes, but this gave me a better understanding of ecosystems. What do you think is important in a guide when going on safari? A guide must work with the wildlife team. He or she must be knowledgeable because our job involves analysing and interpreting what the guests are seeing and giving an eco-perception of that thing. Our guests usually have a high-quality understanding through reading, researching, or spending time on safari. We need to meet and exceed that level to better answer questions and enrich the experience. A good guide is a jack of all trades. I am able to read people who get into my game drive vehicle and get an idea of who they are. This is something I need to manage from time to time so that conflicting opinions and personalities don’t get in the way of the enjoyment of everyone in the vehicle. In terms of the reserve, there are four establishments here and they are spread out. This means there is no congestion when you’re on a game drive and this improves and promotes privacy. The majority of our guests want to see the Big Five. Our job as guides is to enthuse our guests and give them a raw experience no matter what sightings we have on a drive. It is the duty of the guide to make them appreciate and assimilate the environment. 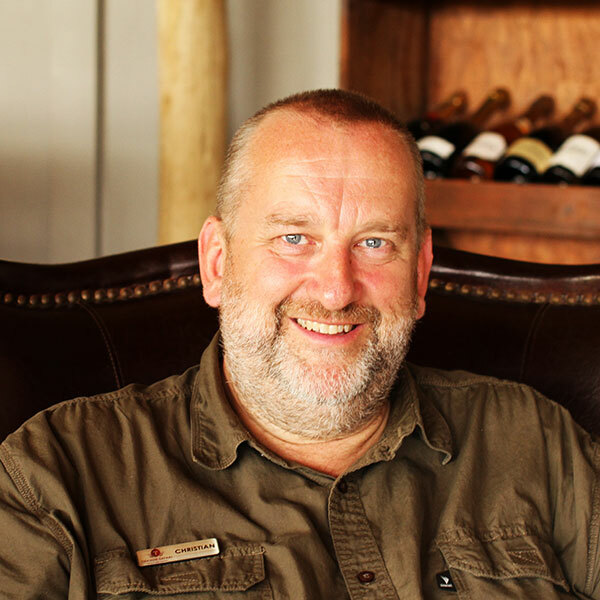 Every element of Thanda is managed by specialist teams who are dedicated to making sure that, from beginning to end, everything is perfect for our guests – from admin to hospitality to wildlife. 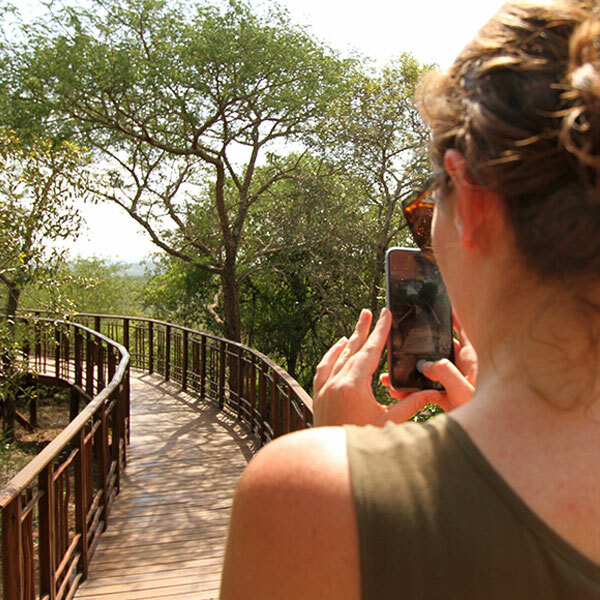 Do you have any comments or observations on the use of mobile phones when on safari at Thanda? Lots of people use their phones and tablets on game drives! They are mostly being used as a camera. When most of the guests on a game drive are using their phones as cameras, I have to go closer to the animals for them to get a good picture. If there are more people using cameras, it is preferable to be at a distance. Some guests use a combination of the two. So it’s something I look out for. Obviously, it is preferable for everyone that phones are put on silent for game drives. We appreciate that people are conducting business. During the drinks stop, a request to take a whole business call isn’t really a problem. 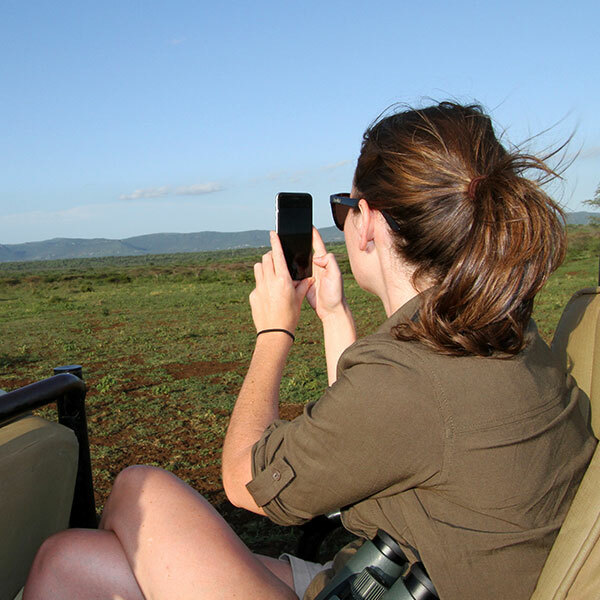 Ultimately, the guest is the boss and they can use their phones as they please but it is the duty of the guide to make sure the behaviour of everyone on the game drive doesn’t jeopardise safety or impact the quality of the experience for other people. I keep my phone on me to do Google research to answer a question if the need arises. Taking photos like a pro! Press play for some iPhone photography tips and an insider's glimpse into life at Thanda with resident wildlife photographer and guide, Christian Sperka. 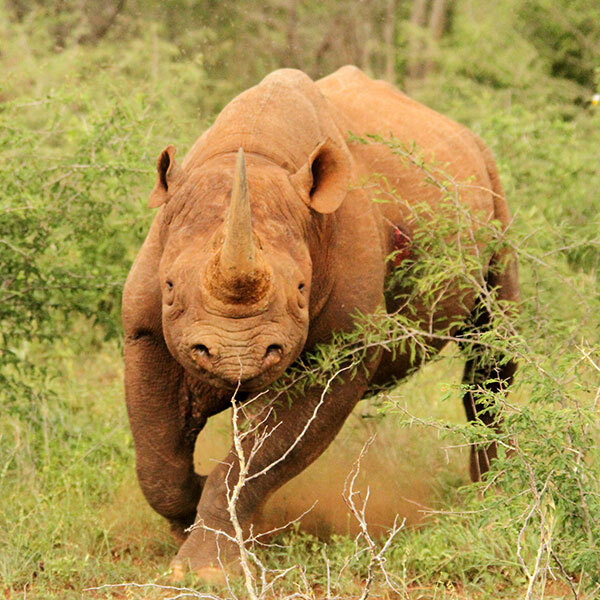 Click here to contact us for advice on a safari to Thanda. Scroll through the images below to see some inspiring photos from our visit. Refreshing drinks welcomed us on our arrival. Claire looking pleased with our luxurious accommodation. Lunch anyone? A pride of lions dig into their fresh wildebeest meal. Our tracker, Zeblon, getting the front row seat on game drives. A quirky Africa-inspired chess set in the lounge area. The tastefully decorated lounge is a great place to meet other guests. The bar is well stocked with a selection of fine wine. The tented camp has a small shop filled with colourful curios. One of the highlights of our trip was seeing a pride of lions with adorable little cubs. A Bulbul enjoying the shallow end of the infinity pool. A young lion crosses the road in front of our vehicle. Claire demonstrates how the iPhone can be used with a pair of Swarovskis to take photos.